Libya's interim coach, Omar Al-Maryam believes his side have the quality to avenge the 0-4 loss to Nigeria when they meet in the reverse fixture of their Cameroon 2019 African Nations Cup qualifier in Sfax, Tunisia today. 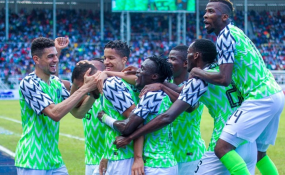 Three goals by Odion Ighalo and a lone strike by Samuel Kalu gave Coach Gernot Rohr's team a commanding 4-0 win and also moved Nigeria up to the second position on the Group E log behind South Africa. Libya knows that anything short of a win will make their qualification for the African championship near impossible hence their determination to have one over the Eagles. Only two teams will qualify for the championship from Group E.
Al-Maryami says his team has nothing to lose today and therefore must go all out for the goals that will give them victory. He also blamed Saturday's loss on ill-luck, saying his boys were punished for some 'uncharacteristic' mistakes. "We were unlucky not to have scored minutes after we conceded, but this result hasn't changed anything. We have a good team and we will fight," Al-Maryami said. He added: "We have a young squad that is very ambitious. Unfortunately, we lost three points and we are sure of taking them back in the second leg, but we must attack the Nigerian team to score." The Libyans will go into the game without their captain, Muhammad Nashnoush, who is suspended having copped two yellow cards in the qualifying series. While Al-Maryami sees this game as an opportunity for his boys to get their pound of flesh from Nigeria, Super Eagles' Manager, Gernot Rohr says he will introduce a different game plan that will confound the Mediterranean Knights. Acknowledging that the Libyans will come for revenge, Rohr says, "Our plan is to do well and be very serious in the second leg. "It will be more difficult, because this team lost 4-0. When you lose 4-0 and you have the chance to play three days later, you want to show that you are better than 4-0.